Yep - FOOD, FRIENDSHIP and FABRIC, what more could a girl ask for to make an week enjoyable and I've been lucky enough to enjoy all three!! 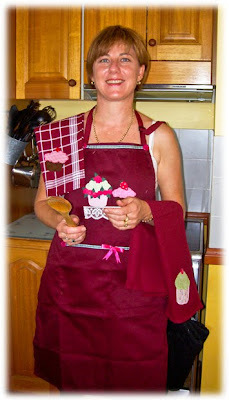 Now, you may remember me mentioning a couple of posts ago that Marion and Steph at Quilters Angel are holding a "Busting At The Seams" sale from today through to Sunday, so Miriam and I very cannily organised to meet up today for lunch at the Chocolate Cottage (cottage burger and chai latte .... MMMMM!!) to build up our strength before we hit Marion's sale. Now, I know it's kind of a funny mix, but you see, they're for several different projects. The greens on the left ... well ... actually, I bought them just cos I fell in love with them! :0) The blues are for two different new designs I have in various stages of production and the three on the end are for a special mission for a friend. And the best bit ... thanks to Marion's Busting At The Seams Sale .. my budget ISN'T ... busting at the seams, that is! Tee! Hee! Hee! Thanks Marion!! And if you're within driving distance of the Village Green at Highfields, you have until Sunday to take advantage of Marion's sale!! Miriam found some yummy fabrics and pretty rick-rack to take back home with her, so you just know we'll both be kept busy playing with our new pretties now! :0) Thanks for coming for a drive up the hill, Miriam, it was lovely to catch up again! 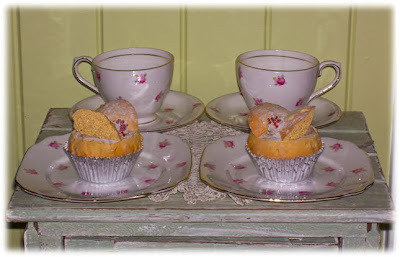 And if you're in search of handmade treasures, pop across to visit Miriam's blog and she'll tell you all about the fabulous Handmade Expo events in Ipswich. Just a little reminder to the OPAM gals ... there's just three days left to get projects finished for February, so don't forget to update your sidebar lists of finishes and email your lists to Peg or I so we can add them to the trusty spreadsheet. Ok ... finally there's been some action around the Meares' Madhouse, even with all the socialising we did on the weekend! Both my Beloved Geek Boy and I got stuck in around the house yesterday and finished not only our household chores, but also a couple of special projects. 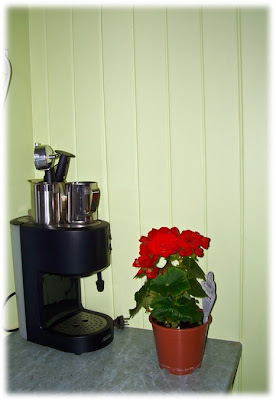 Before I show you what GB finished on the weekend, I need to remind you of the back-story ... Do you remember me showing you this photo when we renovated our kitchen? Isn't it FABULOUS!!! I was SOOOOOOOOOOO happy with it ... GB got smothered in smoochies and nearly had his ribs broken with happy hugs! 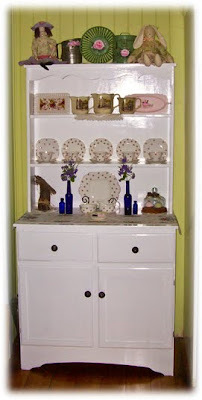 :0) I haven't been able to show you before now, cos he was waiting for the glue to dry on the dowel rods before painting ... then it rained and was bad paint-drying weather ... so Sunday was the first chance he had to paint it a nice glossy white for me to match my face-lifted hutch. I am SO keeping my GB! 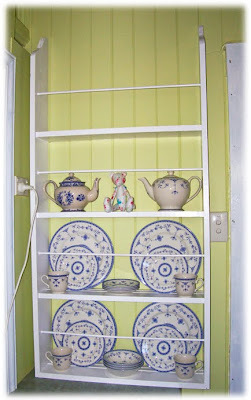 :0) I even have some extra space up on those top shelves for future additions to my pretty china collection - YAY! 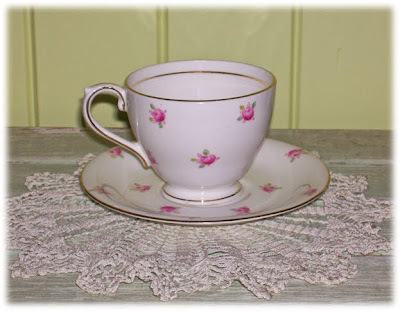 Hey Lovely Lilly Linda ... MORE collectibles fairs!! Tee! Hee! Hee! Thank you for a PERFECT Valentine's Day giftie, Sweetie!! He's not very big, he'd fit inside the teapot. In fact ... I think I will christen him "Teacup"! So ... there you go ... they're the projects finished in the Meares' Madhouse in the last 24 hours. I also made some progress on a companion project to my shabby patchwork hearts, so stay tuned for a pattern release in the not-too-distant future. And now ... I'm off to cook some dinner before heading off to our After Five Monday night rehearsal - LA, LA, LA, LA, LAAAAAAAAAAAAAAAHHHHHH!!! OK ... so ... as I said last post, I headed off down the hill to Brisbane bright and early Friday morning to spend the day with my Bestest Buddy Lynette. We had decided to have a bit of a relaxed day, stitching at her place before heading out for lunch. Well ... we DID spend some time at her place and then go to lunch ... we just seemed to skip the 'stitching' part of that plan! :0) You know how it is when friends get together - the chatting rages out of control and before you know it two and a half hours have passed and you've barely scratched the surface of what's been happening with you both since last time you caught up! 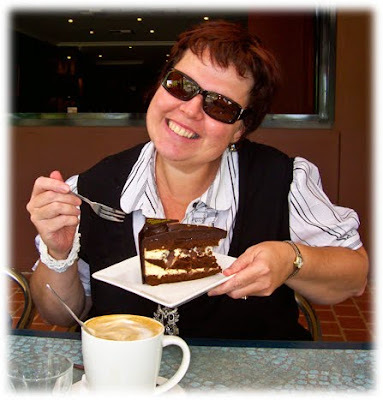 After enjoying a relaxing chat over a final latte, I then scooted home just in time to get a text message from the Lovely Lilly Linda to tell me she and her beloved, Tim, were just a few minutes from our place! YAY!! We enjoyed a relaxed lunch of chicken and salad on fresh bread rolls - prepared by my Beloved Geek Boy!! How spoiled am I to have a domesticated hubby!! :0) and chatted ... and chatted ... and chatted!! 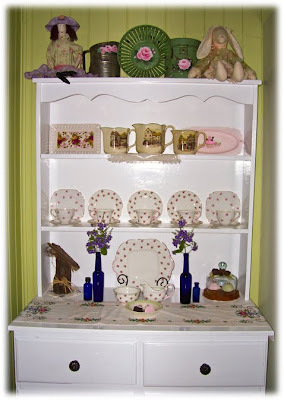 :0) Then, fortified with yummy lunch, we headed off to the showgrounds to the Antiques and Collectors Fair. Ooooooohhhhh!!! The pretties we saw!!! But I was a good girl ... relatively ... and didn't blow the budget too badly, adding to my pretty bottle collection. 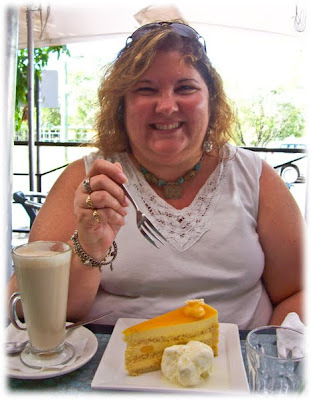 A mango and lime torte and a chai latte. Hmmm ... not my best look, perhaps, but you can tell I was having a good time and I guess that's the main thing, right! Although, looking at my multiple chins, perhaps I should stop socialising at coffee shops! Tee! Hee! Hee! 1 Corinthians 13:13 "And these three things remain: Faith, Hope and Love ... and the greatest of these is love." Yes, it's double Happy Dancing all around the lounge room today - oops! There go the neighbours again complaining about our clog-dancing pet elephant! :0) I have TWO exciting things to share with you today, so BRACE YOURSELF!! to Bronwyn for such a wonderful prize - I'm pretty sure that I'm addicted to Bronwyn's stitcheries, especially her stitchin' ladies. Busting At The Seams Sale!! It runs from Thursday February 25 to Sunday February 28 and a 'little birdie' told me that there will be MASSIVE savings to be had, with some fabrics being reduced to as little as $5 per metre! WOW! OK ... those dates are SOOOOOO marked in my diary, cos a gal can never REALLY have TOO much fabric, right?! Tee! Hee! Hee! Specials only apply to IN STORE sales, so you'll just HAVE to come and visit Marion at Quilters Angel at Highfields to see WHY this has become my home-away-from-home. And while I was telling you all about this, I had a ... THOUGHT!! It's OK, I was sitting down, so I didn't hurt myself! :0) My thought was this ... maybe there are some blogging buddies out there who would all like to kill TWO birds with ONE stone. Well ... not literally of course, cos that would be mean to birdies!! 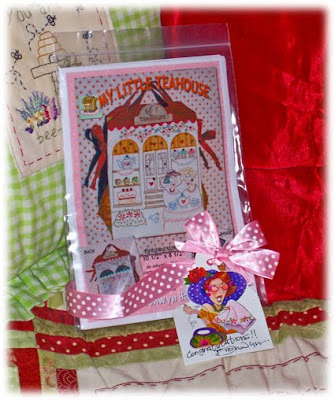 Perhaps we can combine a little stash-stocking at Marion's sale with the opportunity to have a bloggy get-together?! 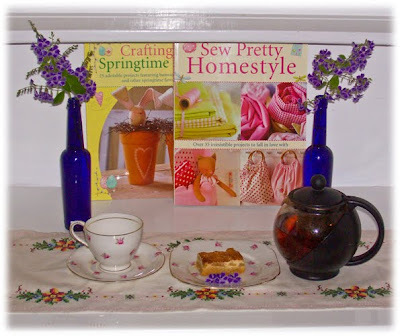 If there are any bloggers within COOEE of Toowoomba who think they might like to check out Marion's "Busting At The Seams Sale" AND meet some blogging buddies in person for a cuppa and a chat ... let me know. We just might make an outing of this if there is enough interest. 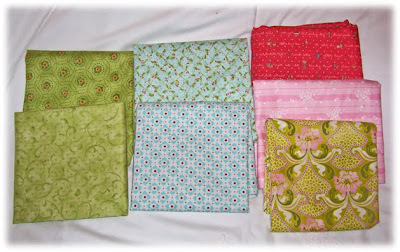 And if not ... All the more fabric for ME! Tee! Hee! Hee! How was your day today? Mine was NOTHING like I'd planned!! And while that was partly frustrating, cos I didn't get anything done (except a couple of loads of washing and a bathroom clean, does that count?!?!) I DID get to catch up with some friends, so I can't really say the day was 'wasted'. It just wasn't what I'd planned! Hmmm ... in fact, I think that's the epitaph they should put on my headstone ... "This wasn't what she'd planned!" Tee! Hee! Hee! Some of this collection came from MY Grandma and some came from my beloved GB's Grandma Kent. 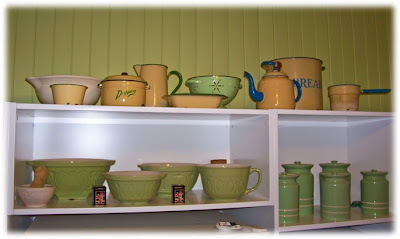 The white mixing bowl you can see on the left at the back was rescued by my Gramps from the Emerald tip years ago. Apparently, the local school had a huge clean out to 'update' their Home Science department and tossed out all sort of perfectly good stuff. This bowl is HUGE, so Gramps cleaned it up and took it home to Grandma. I bet it could tell a story or two about cooking disasters! :0) Of course, this was in the days when you were allowed to find and take home 'treasures' from the local tip - no more! Oopsie! That fridge isn't too 'photogenic' is it! :0) I think like most people's fridge, it's full of notes and mementos that are put there cos we spend so much time at the fridge that hopefully it will jog our memory! :0) I love the drawing there, though, as it was done for me by my goddaughter, Erin. And do you know what has suddenly occurred to me? 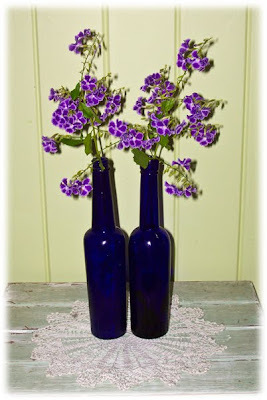 That it's not just how pretty these things LOOK that makes me want them in my home - though they do look good, don't they! :0) It's the STORIES that are attached to each item. 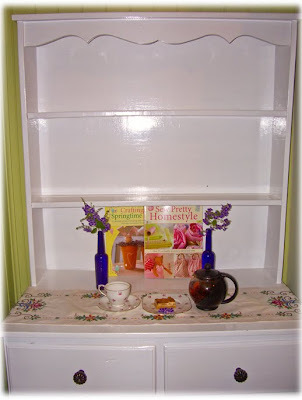 My home is full of wonderful stories, with each of my 'pretties' acting as a prompt to my memory. 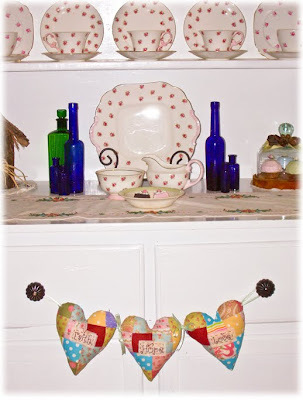 No wonder I love puddling around decorating so much! 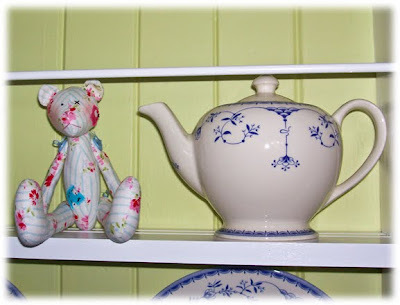 :0) Do you have 'pretties' at your place that have a special story attached? I'd love you to share some with me! Why not post some photos and tell your stories, then let me know so I can enjoy YOUR stories too! Nope! No stitching going on here today! Why? Cos I was too busy enjoying the results of the postie's visit!! The last two of my Tilda books arrived! YAY!! So, as you can see ... I was WAY too busy enjoying a cup of tea, a piece of apple slice and a relaxed browse through my new 'friends'. Aaaaaaaaahhh!! Now THAT'S the way to spend the afternoon! 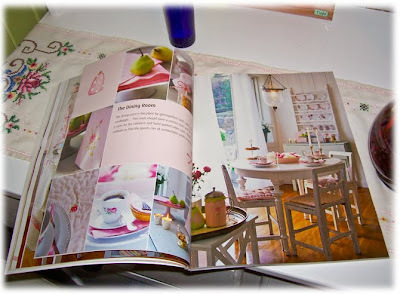 :0) Would you like to take a peek as why I have fallen in love with these books? 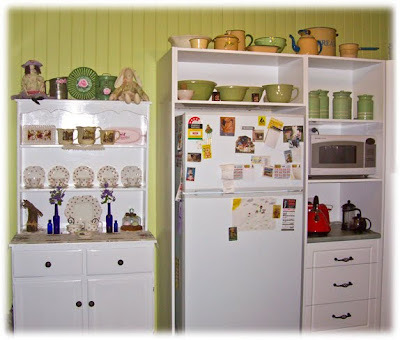 Don't you wish your kitchen looked as pretty as this? Mine received its renovation makeover last year and STILL doesn't look this good! :0) I'm working on it though. Tee! Hee! Hee! Now, you should have guessed there would be a BEAR in there somewhere, right?! :0) And what a cute teddy bear this one is. Oh dear! Did you just hear my "To Do" list scream in agony as I mentally added most items in the books to it? Tee! Hee! Hee! I couldn't take the full length as there are a couple of boxes of 'stuff' in front of it waiting to be sorted - do you put those sort of jobs off too or is that just me?? 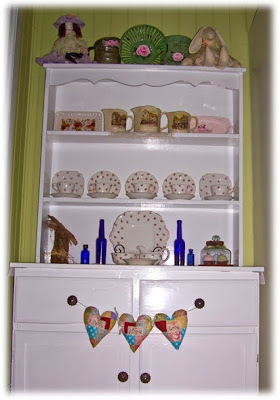 I forgot to take a "Before" photo of the hutch prior to it's paint job - oops! But the white sure is an improvement and I love how the vintage runner looks on it - I'm a sucker for vintage linens, especially if it has pretty cross stitch or embroidery on it. No, no! I haven't been hired by the British Broadcasting Company to report on the doings in blogland ... though that could be fun! :0) My BBC report is about the bottles, bears, china and collectibles encountered at the Toowoomba Antiques, Collectibles Fair and Swap Meet that we visited yesterday. While the Antiques and Collectibles Fair is an annual event, we hadn't actually attended last year due to GB having to work (he probably did a happy dance at that mixed blessing!) so when we arrived, we were more than a bit shocked and gobsmacked to see how HUGE this fair/swap meet was!! I wish I'd remembered to take my camera, cos the photo of the car park would've blown you away, I'm sure! For a moment, I thought GB was going to do a quick U-turn and head home again, but being a loving hubby, he knew I REALLY wanted to have a look, so we parked the car and joined the steady stream of people walking towards the entry gate. We walked ... and we walked ... and we walked ... you just about needed a cut lunch to get to the ENTRY!! Hmmm ... this was all VERY different to our last visit to the fair! However, we paid our entry fee and began to wander. OH!! What TREASURES there were gathered in that dusty showgrounds!! If I'd had unlimited funds ... and a very large truck to get it all home!! ... I could have bought just about anything you care to name, cos I'm sure it would have been represented there! We walked MILES, I'm sure of it, and even GB who is not as prone to exaggeration as I am, said that it was probably a two kilometre hike from where we parked the car to the front of the showgrounds, where we then turned around and headed back again. By the end of it, we were hot, dusty, thirsty, footsore (I wore sandals not realising just how far I'd be walking!!) and a little sunburnt, but it sure was an adventure! Aren't they PRETTY!! I just love the little roses on the white background. They're pictured here with the two GORGEOUS and incredibly realistic faux butterfly cakes that the lovely Kerryanne sent me for Christmas. I actually got these two trios for the bargain price of $10 for both, as the one on the right has a crack in it (doesn't matter for display purposes!) and it was almost time for the exhibitor to pack up, so I think he was trying to sell things so he didn't have to pack them to go home! Tee! Hee! Hee! A couple of pretty blue bottles. 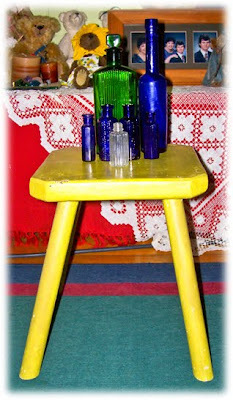 It doesn't show quite so well in the photo, but when the sun shines through the blue glass, these bottles are magic! Such a vibrant blue. One is for my little collection of vintage bottles and the other is for a friend who was eyeing off my collection on a recent visit. I thought I'd buy her a bottle to get her started on her own collection, after all, the hunting and collecting is half the fun, right! :0) And the flowers are sprigs from my Geisha girl shrubs in the front yard - they've loved the recent rain we've had and are flower madly and sending new shoots out everywhere. Her name is Ruby ... now! 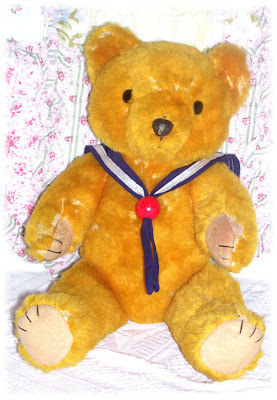 :0) The lady I bought her from said she used to have three sizes of this style of bear, one big, this one and a smaller one, so she called them Papa Bear, Mama Bear and Baby Bear. This bear is in pretty good condition except for some mold stains on one footpad ... I'm not sure if I like her dress or not, though. 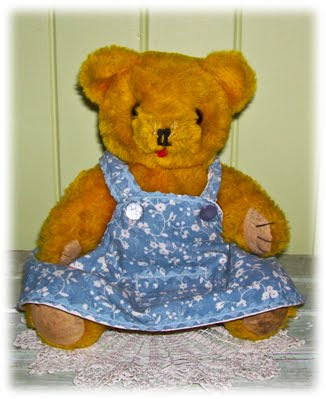 She may end up with a new outfit in the future, as she really doesn't strike me as a Mama Bear particularly and she will be keeping my other Collectibles Fair rescuee, Rupert, company. Remember Rupert? It's our home, and we won't leave without a fight!" So to all in the fire-affected regions, we send our thoughts and prayers to you and look forward to seeing the phoenix rising from the ashes - cos it's your home and you won't leave without a fight! Yep ... that's what I have to share with you today ... bits and bobs! Hmmm ... I wonder where that saying came from? Will have to Google it sometime. What on earth did we ever do before Google was so readily on hand to answer all our odd and random questions?!?! And if you talk to my Beloved Geek Boy, he'll tell you I am just chock-full of odd and random questions! Tee! Hee! Hee! 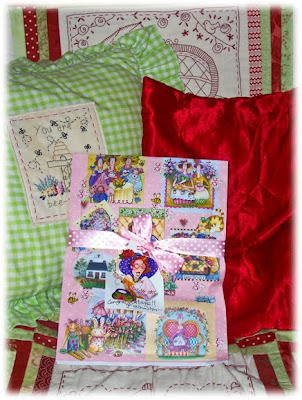 OK ... first I'll let the OPAM gals know ... if you haven't already caught up ... Peg has posted the winners of the very first end-of-month draw for OPAM 2010, so pop on over to see who the lucky duckies were. Thanks to everyone who emailed their list of finishes to Peg or I - this was a HUGE help to us and made the process much easier and less time consuming ... so we had more time to stitch too! :0) We did run into a couple of blogs that didn't have the OPAM button linking back to Peg or I, so if you haven't got round to doing that yet, if you can, it would be appreciated. We also found a couple of blog links we've been given either didn't work, or went to a blog that didn't seem to be active. 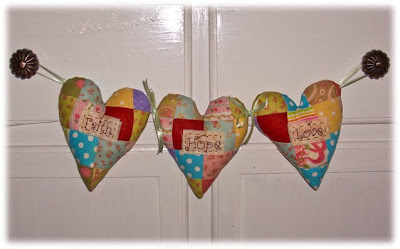 (To add your links to our spreadsheet, we copied and pasted, so if ours is wrong, it's because that was what we were sent) Half the fun of OPAM is everyone blog-hopping to peek at the projects being created by other clever crafters, so even if you just pop a short post on from time to time with photos of your finishes, that would be great. If you can check your link on both Peg's and my sidebar list, that would be helpful too. A total of 687 projects were finished in January by OPAMers! WOW!! How's THAT for starting the year off with a bang!! :0) Well done to you all! 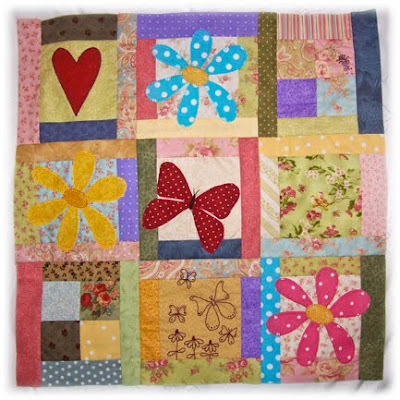 And well done to all of you who didn't register a finish, but made some good progress on some bigger projects - I know a few of you have been making blocks for swaps or working on long-term larger quilts and since I'm working on my version of "Butterfly Garden" I know that some projects just take a bit longer to tackle. But that's OK, cos remember that enjoying the journey and process of creating something is every bit as important as having a finished project. So keep stitching, gals and we'll see if we can beat that number next month! I'm pretty chuffed with how it's coming together - and my Beloved Geek Boy is happy that I've promised NOT to buy any more fabric to create it - it all has to come from my stash. Hmmm ... shouldn't actually be a problem with that - there certainly isn't a fabric shortage in my sewing room! :0) I've started piecing the mini blocks for block 2, so I'll show you them when they progress a little further. Aren't they YUMMY!!! I thought that green and red were likely to be my most used colours, so that's why I started with them ... yes ... STARTED ... because I'm pretty sure I'll be adding to this little collection before too long - they are all just so pretty!! 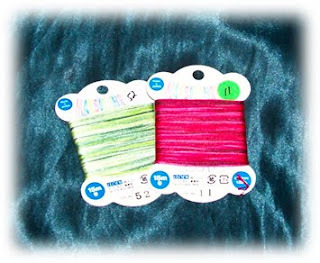 Marion has a great range of colours in the Cosmo threads, so you can stock up ready to stitch! :0) Of course ... she also has LOTS of other yummy fabrics and quilty bits, so it could be just a little dangerous to your budget if you pop in to play in person or online but WHAT a way to GO!! Tee! Hee! Hee! 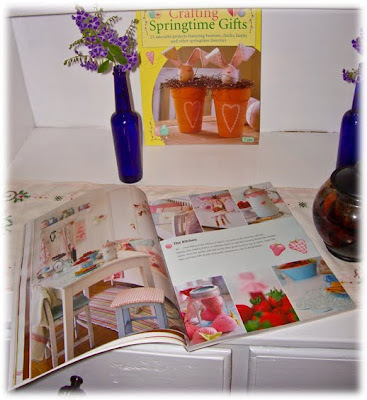 Remember I said I enjoyed browsing through the Lovely Lilly Linda's craft and decorating library? Well ... I came home and promptly ordered my three favourite of the Tilda books from Fishpond - and didn't pay full price for any, thanks to a special offer and some specials! YAY! 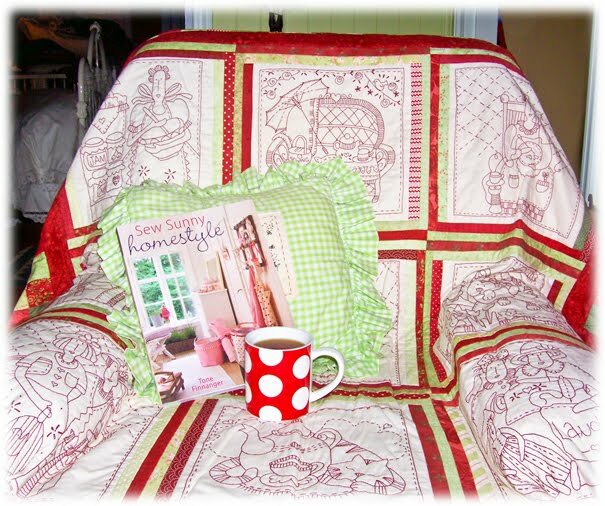 This is the first one to arrive - Sew Sunny Homestyle and I think I love it best of all! 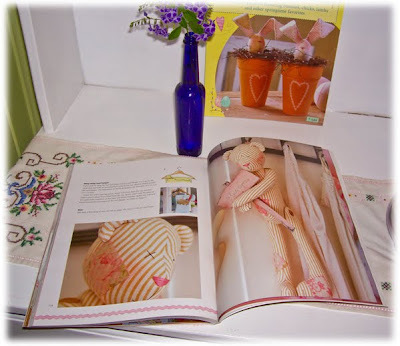 It's not only a great craft book, it makes a GORGEOUS coffee table book. The photos are amazing and you just want to crawl between the pages and live in that house! 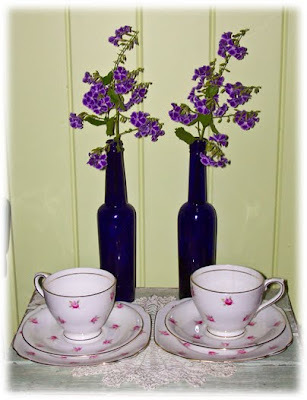 :0) So I'm off to drool over the pictures and have a cup of lavender tea.